A number one plumbing problem is generally located at the kitchen or bathroom sink and necessitates leaky faucets repair. Most people generally think of leaky faucets repair as work done to stop the drip that comes out of the spout when the handle is turned off. While that is one form of leak, leaks in faucets can come from two other areas. If you have a wet area in the cabinet under the sink, a leaky faucets repair generally has to be performed where the water supply goes up to the mixing valves in back. This is a difficult place to get to with a wrench, and this leaky faucets repair is made easier with a basin wrench. A leak underneath the sink can also be attributed to a trap or a broken seal around the sink itself. 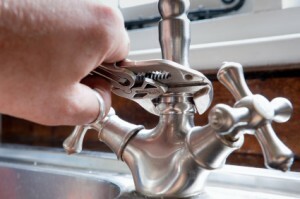 Before you attempt leaky faucets repair, be sure that those are not the cause of the problem. The faucet assembly has two threaded extensions that go through the sink with nuts holding the parts tightly in place. Sometimes a leaky faucets repair is necessary because the rubber gasket between the sink and the seat of the faucet becomes worn or the nuts holding it become loose. The leak is from water that sits on the sink and seeps through. If this is the case, it may require cutting the water off, taking the faucet loose, and replacing the gasket. Don’t even attempt to do this with a regular wrench because you will bang your hands and lose your temper long before finishing the leaky faucets repair. The basin wrench is the tool for this job. The second concern under the sink for leaky faucets repair is where the water supply attaches on either the hot or cold side. The supply lines screw onto the bottom of the two stems that hold the faucet to the sink. The basin wrench can usually tighten these sufficiently to complete the leaky faucets repair. If leaky faucets repair is necessary from the spout or the mixing valve handles, the problem is from one or both of the stems that are seated beneath those handles. A leak around the handles generally means that the nut holding them into their seats is not tight enough. For this situation, leaky faucets repair can be accomplished by removing the screws that hold the handles. The nut is exposed and can be tightened with a crescent wrench. You must be careful doing this because too much pressure can easily strip the plastic threads. The most common leaky faucets repair is made by replacing the springs and rubber gaskets under the two stems. You will need to get the replacements from a hardware store in Tampa before attempting this leaky faucets repair project. To do this, find the brand name and style of the mixing valves. These instructions are obviously for a two handle faucet. A single lever faucet will have a different assembly, but the stems are similar. When you have replacement parts, turn off the water and loosen the nuts holding the stems into the assembly. The springs and washers are under them and can be fished out with a small screw driver. Replace them and reassemble everything. Of course, the best way to achieve leaky faucets repair is by getting a qualified Master Plumber in Tampa to survey the situation. Any plumbing repair requires having the right parts and tools, and most homeowners don’t have those lying around the house. PUR Plumbing is available round the clock to stop your leaks before they become a real problem. They are your primary choice for any plumbing needs in Tampa, Florida and the surrounding area. Before you skin your knuckles and spend money on tools you will rarely use, give PUR Plumbing a call for an on the spot estimate and quick repair.